martinMARTIN is wearable avant-garde clothing, a revolt against glamour in the traditional sense. It is a decidedly relaxed approach conveyed through soft fabrications / leathers and architecturally inspired shapes. The collection utilizes the shape and the drape of the Orient, the tailoring techniques of Italy and the casualness of the American lifestyle. martinMARTIN STORE is located in The Historic Core of Downtown Los Angeles, California U.S.A. 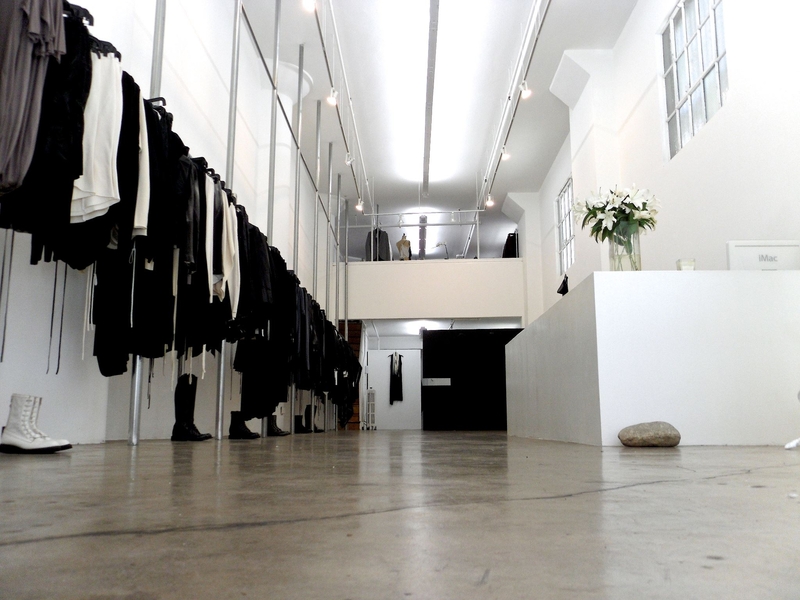 The 1,713 square foot store is the first for Los Angeles-based martinMARTIN. The firm is celebrating 10 years in business. The husband and wife team of dianeMOSSMARTIN and ericMARTIN designed the interior of the space. The couple had both the architecture of the store and the clothing in mind and did not see these elements as being separate. The store houses the entire martinMARTIN product line including women’s and men’s clothing, leather, hand-crafted boots, handbags and accessories. The environment encompasses two levels, with the mezzanine housing the menswear collection and doubling as a showroom during market weeks. 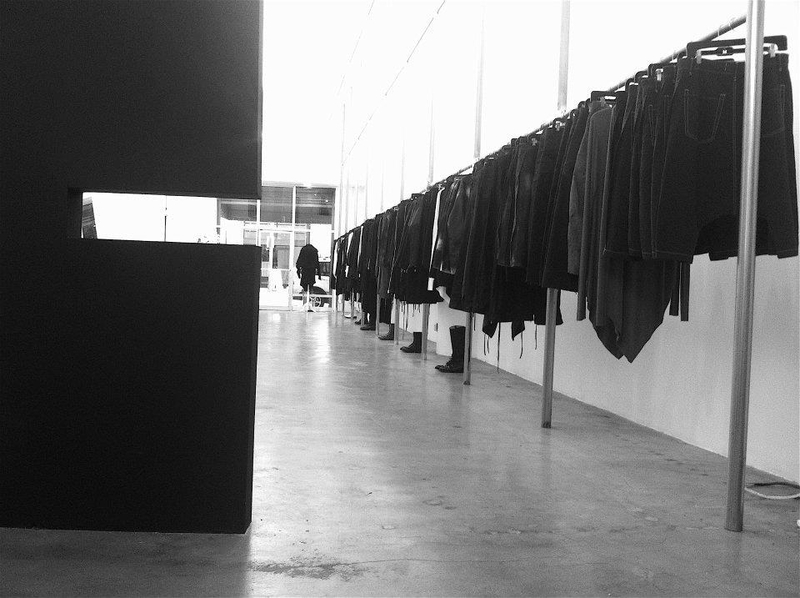 Inside the austere monochromatic all white environment (that reads more art gallery than fashion boutique), the collection is suspended from a single 17 foot floor-to-ceiling sculptural rack system that spans the entire length of the store. A plaster shelf appears to float above the cracked and fissured untreated concrete floor. A 15 foot long minimalist sales counter and the characteristic use of lighting elements supply the distinctive martinMARTIN signature. Every element in the space was reduced to essentials with no attempt to conceal the structure or embellish the surfaces. To walk around the store is to experience a complete picture of martinMARTIN’S world. Each element–clothes, furniture and design has its place and each is equally important in conveying the company’s point of view. The store will not be a closed environment. There always be room for change. As the designers focus on a photographer or architect, or perhaps a legendary surfboard maker for their design events, they will always look with a fresh eye towards the future. Image:: Lisa Ophoven Photography:: www.lisaophoven.com. Photograph shot on location in Downtown Los Angeles, California U.S.A.
My first comment is to commend you for your vision and design. I was walking the street there the other day going to our classrooms which have now been moved. I loved looking into the window and was dazzled. I couldn’t go in as you were not open yet. I teach the creative design classes and would love to one day bring my special group of 10 Debut students to see your store and product. If that is possible, please let me know. Debut is 10 specially selected students for an advanced program. their cool outfits and carrying their work bags so full of hope. we will make an effort to accommodate your request. We are super busy preparing for Paris at the end of February. But, let’s try and do something.